This past Memorial Day was truly the most memorable of my life. My son, Army Sgt Steven Case, and my friend Dagmar both had a lot to do with that. As we set off for Fort Stewart, Georgia, to meet Steven’s battalion returning from his second deployment, I couldn’t help thinking of how it all began. My son was ten years old when he heard his dad reminiscing about the rigors of Army basic training. “Some parts of it were really tough, but I was just glad I never joined the Rangers. Those guys had it the toughest of all!” My son’s response? “Cool!” From that day on, he wanted to join the Army. 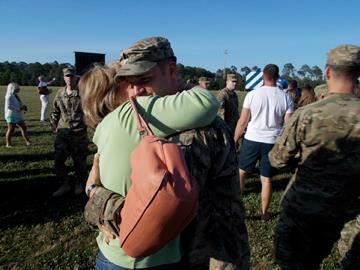 And so, one month after high school graduation, we took him down to the recruiting station, hugged him goodbye – and he was gone! The world never seemed so big, nor my son so young as at that moment. I found myself worrying not only about his physical safety, but about what four years of the Army might do to his faith. My friend Dagmar was one of those who had committed to hold Steven up in prayer. Dagmar has her own distinctive way of expressing things. She was specifically praying that Steven would return from deployment “with everything that he left with.” I had to agree with that! Steven had wanted to see if he “had what it took.” So, after Basic Training (in the 120-degree Georgia heat) came Advanced Infantry Training, Jump School, and finally Ranger Assessment & Selection (RASP.) And yes, he had what it took. And thanks no doubt to the prayers of Dagmar and company, he came through it all unscathed. He had decided right at the start to be up front about his faith. He paid the price many times, and in more ways than we have yet been told of. The net result? He’s become pretty fearless. He’ll talk about anything to anybody. We arrive at the fort, and what a day it was! The Army band playing. Family members of all ages eagerly waiting. And oh, it was so wonderful to hold my boy in my arms again, safe and sound on the soil of the good ol’ U. S. of A. It’s probably Dagmar’s fault, at least in part, that he didn’t get all the combat experience he had expected. But praise the Lord, he did come back with everything that he left with! Thank you Karen AND Steven!!! Possibly his guardian angel has a bent feather or two. 🙂 Praising GOD with you that he is back safely. Thanks, Steven, for faithfully serving your country and your GOD!